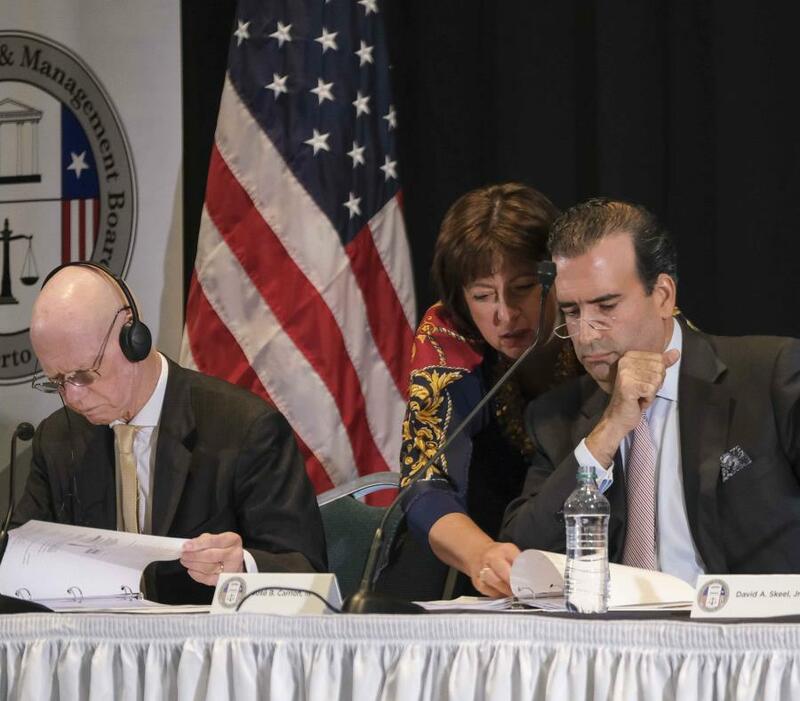 Washington - In an ideal scenario, the Oversight Board –overseeing Puerto Rico´s financial decisions- anticipates their work will take, at least, another term. After delivering a keynote address at Georgetown University, the Board´s Executive Director Natalie Jaresko said that, right now, they want the Puerto Rico government to have its first balanced budget for fiscal year 2020-2021. To do so, the government must have completed restructuring the nearly $70 billion debt and another $45 billion in retirement systems. This seems super ambitious since so far, the Board and the government have only reached restructuring agreements for the Government Development Bank and (GDB) the Sales Tax Financing Corporation (COFINA) and preliminary deals on the debt of the Puerto Rico Infrastructure Financing Authority (PRIFA) related to the Ports Authority and the Puerto Rico Electric Power Authority (PREPA). PROMESA established four consecutive balanced budgets, and medium and long-term access to financial markets at reasonable rates in order to end the JSF's control over the island's elected government. According to the Board´s plan, if things worked out well in fiscal terms, the first opportunity to achieve four consecutive balanced budgets would be between fiscal years 2020-21 and 2023-2024. In other words, if by June 2024, the government completed its fourth year without a budget deficit, then the Board would have met one of the two goals it was entrusted with, which would lay the grounds for the entity to gradually leave the island. Any setback in the process to balance four consecutive budgets would imply to start all over and, at least, another four years. By the time Puerto Rico reaches four consecutive balanced budgets, it will remain to be seen whether the island has entered the financial markets at reasonable rates or achieved the necessary credit rating to issue new debt, Jaresko said. And to have access to Wall Street, it will be necessary to have audited financial statements, she added. Meanwhile, PREPA Executive Director José Ortiz told El Nuevo Día on Thursday that they close to reach a definitive agreement on $9billion debt obligations, which Jaresko also confirmed. In addition to PREPA´s agreement, the Board still has to complete "at the end of the year", the restructuring of the government´s General Obligations (GOs), for approximately $17 billion, including government guarantees to other debt issuers. Last January, the Board and the Unsecured Creditors Committee (UCC), filed a lawsuit requesting Judge Laura Taylor Swain – presiding over Title III cases- - to declare invalid $6 billion in GOs. A month earlier, the UCC and Board also asked Swain to invalidate the financing structure of the Public Buildings Authority (PBA), which would cancel another $4 billion. Jaresko also anticipates implementing the reform in the retirement system before the start of fiscal year 2020-2021, one of the most controversial issues that can be decided in the middle of an election year. "That's in the adjustment plan," she said. The government and the Board have not only to reach definitive agreements with constitutional bondholders and other creditors of corporations such as the Highways and Transportation Authority (PRHTA) and the University of Puerto Rico (UPR), but they will also have to get Swain to endorse such agreements, either through PROMESA Title III or Title VI that provides for out-of-court settlements. This entire calendar depends on no setbacks for the Board, whose current members face the May 16 deadline that the First Circuit Court of Appeals set for President Donald Trump and the U.S. Senate to agree on reconstituting the entity or confirm its current members. On February 15, the First Circuit Court of Appeals declared that the appointment of the members of the Financial Oversight and Management Board were unconstitutional, since they are federal officials and were not appointed according to the U.S. Constitution’s appointments clause, which requires the U.S. president to seek Senate advice and consent to confirm an official. Jaresko said on March 18 that “in a couple of weeks”, the Board would file a petition of certiorari before the U.S. Supreme Court to review the First Circuit's decision and maintain the current balance among the Board members. Now, they anticipate they may file it before the end of the month. Jaresko said they are working on the petition of certiorari and that it should be ready in the next following weeks. The Board´s plans include asking the First Circuit Court of Appeals to extend the May 16 deadline until the Supreme Court decides whether to review the appellate court´s decision. “We can confirm people in 90 days, (the issue) is when does that clock start”, said the chairwoman of the U.S. Senate Natural Resources Committee Republican Lisa Murkowski (Hawaii), after the First Circuit´s ruling. President Trump now has more than two weeks to send his proposals since Congress is on Easter-Passover recess until April 29. However, Jaresko said she expects President Trump will not send the proposals to the Senate before the case reaches the Supreme Court. Several sources - as The Wall Street Journal reported a few days ago - indicated that the White House and the Senate leadership are considering appointing the current members of the Board, whose term expires on August 31. "There should be no doubt that the President and the administration are committed to all the elements of Promesa being implemented for the benefit of the people of Puerto Rico," said Javier Ortiz, executive director of FixPuertoRico.org and who worked on Trump's Transition committee. Amid President Trump's criticism of the island's authorities, Ortiz stressed that "the White House has been clear about the need for transparency and the Board is the only vehicle so far to achieve that. He also considers that appointing the current Board members would be a way to recognize the will of Congress. Although before the First Circuit´s decision the term of the Board member expired on August 31, the law provides that they can continue until a successor is appointed and that they can serve consecutive terms. Six of the seven members of the Board were appointed following Congress leadership recommendations which brought a balance between Republicans and Democrats. The seventh member was directly appointed by former President Barack Obama. PROMESA provided for Obama to appoint the seven members and send them to the Senate. But, there only three months between Congress approved the bill and the date to confirm them and with Republicans in the Senate majority - as it is now - that option was politically unfeasible. Obama decided to implement the mechanism that the federal First Circuit Court of Appeals declared unconstitutional. In addition to directly appointing one of the seven members, he selected two members proposed by the Speaker, two by the Senate Majority, one by the House Minority and others by the Senate Minority. According to sources, Obama directly appointed banker José Ramón González; then speaker Paul Ryan proposed José Carrión and Carlos M. García; Senate majority leader Mitch McConnell suggested Andrew Biggs and David Skeel; then minority leader and now Speaker Nancy Pelosi recommended Ana Matosantos; and Democratic Senate spokesman Charles Schumer recommended former judge Arthur González. Biggs, a pension expert who works for the conservative group American Enterprise Institute (AEI), and Skeel, a professor of corporate law, are known to be willing to continue in the Board for an upcoming term. Rumors in Puerto Rico's financial circles are that García and José Ramón González would not continue a second term.